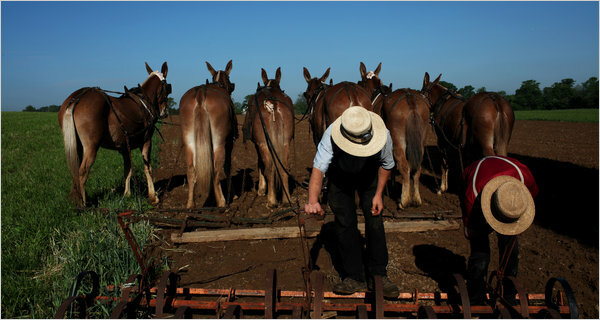 This entry was posted on June 9, 2010, 11:04 am and is filed under Amish In The News. You can follow any responses to this entry through RSS 2.0. You can leave a response, or trackback from your own site. What about the whole cow/chicken/pig biomimicry approach that Joel Salatin uses on his Polyface Farm? Why didn’t the EPA mention that instead of digging a big hole to throw your money into hold all your cow feces? So they go after the Amish and not Big Ag who have more cows and or cattle. The only reason they are going after them and ALL farmers is because of competition. They are correct in not trusting the Government, who does? Land use follows the UN Agenda21/Sustainable Development. they are now attacking our consumption patterns. All I can say is the Amish need to start fighting back other wise they will all be shut down.